FUNCTION FOLLOWS FORM at the Rigid String Level, with a Pairing-Splitting Dark Matter Black Hole . : First Evidence for Evaporating Dark Matter Particles in Silicon fireballs. The Quantum FFF Model mimics all Relativity: 1: The BALL LIGHTNING dark matter black hole is the key to understand the universe. 2: Black holes they repel all Fermions not photons 3: BHs have real hard hairs, in the form of two or even more plasma jets, ejecting all the plasma swirling around the BH not able to enter the BH by the BH repeller effect. 4: Dark Matter is the same as BHs 5: Dark Energy Casimir pressure is one part of dual Quantum Gravity, opposing graviton pressure. QUANTUM FFF STRING THEORY and the Propeller Fermion Propeller. If the big bang was the splitting of a huge Axion/ Higgs particle Dark Matter Black Hole (DM- BH) nucleus into smaller DM-BH nuclei, then no standard Fermion/ Baryon inflation has happened only the DM-BH based Lyman alpha forest equipped with local Herbig Haro star/galaxy creating systems. 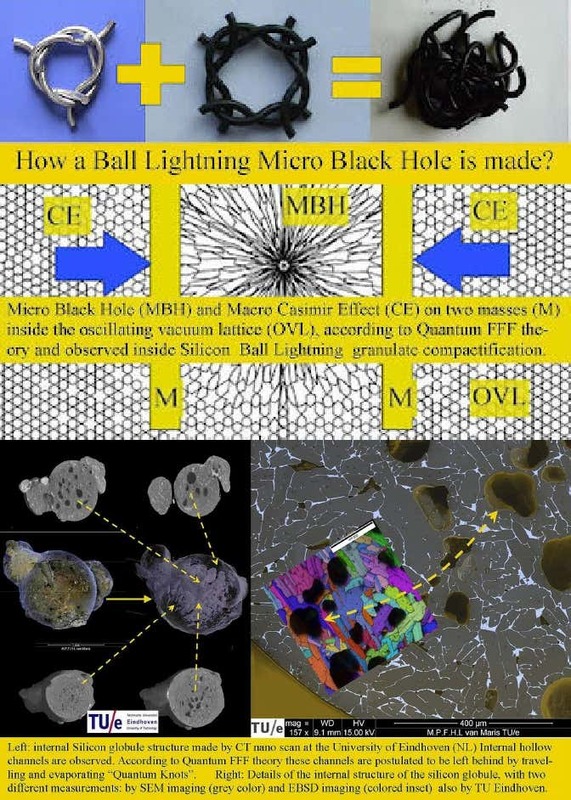 All black holes of all sizes (down to ball lightning) seem to be equipped with a Fermion repelling- and plasma producing horizon, which has also a charge splitting effect into a negative (outside) and positive ( inside) zone ( see oriental basin of the moon) .Conclusion, all Bhs are: "Negative Charged Electric Dark Matter Black Holes" with a rigid open string sector with intrinsic 3x hinging curvature. First Evidence for Evaporating Dark Matter Particles in Silicon fireballs. unusual complex internal and external structures. was reason to compare these complexities in detail and make suggestions for future research. Lightning often observed in the natural environment.. The Fermion Propeller Repelling Black Hole. Feeding the Dragon Sagittarius A with smaller Black Holes (G2) covered with Gas envelopes. Fermion Propeller Strings, solving the Black Hole Information Paradox and our Energy problem. The mystery of Globular Cluster HP1, explained by Quantum FFF Theory. 10th of April 2019, next Wednesday, what observation could be new? Merging Galaxy Cluster distribution mystery explained by Quantum FFF Theory. MODELS FOR A THEORY OF EVERYTHING. The Quantum FFF theory also on Vixra. The NEW Black Hole Paradigm blog. THE PROPELLER SHAPE OF FERMIONS is THE origine of Fermion repulsion outside the new Electric Dark Matter Black Hole ( EDMBH) event horizon. EVEN around BALL LIGHTNING. Double click on the image for BASIC article and video.